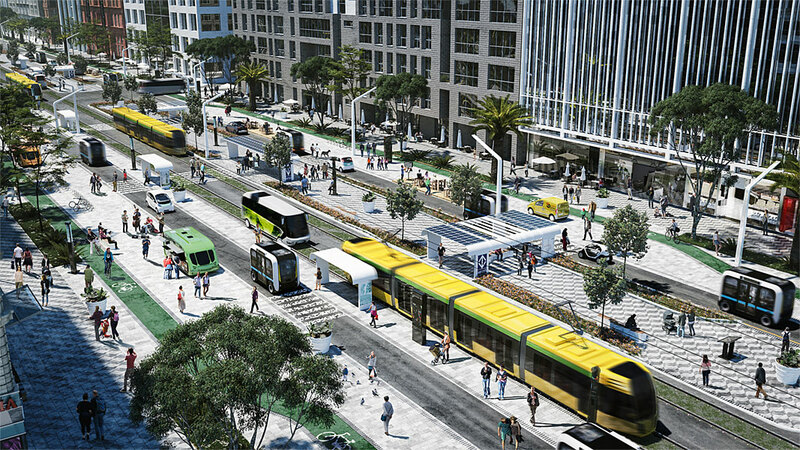 Photorealistic rendering based off of concepts in the NACTO Blueprint for Autonomous Urbanism. Copyright © 2017 Bloomberg Philanthropies. Reproduced with permission by Bloomberg Philanthropies and the National Association of City Transportation Officials. Featuring 40 projects that explore salient topics around the future of mobility and the urban environment, the exhibition is punctuated with six provocations and a selection of design responses that reimagine livable streets and the way people, goods, and services will move in a new age of connected and transformational mobility.